Sweetwater’s Donut Mill – Kalamazoo Twp. I told you I was gonna do it. Didn’t I? This afternoon, I posted an article from Saveur that had Sweetwater’s Donut Mill as one of the best 100 Food Finds in the country. It made me hungry. I wasn’t going to, but as the night wore on, I got hungrier and hungrier. I needed to go get gas anyway. I’m driving to East Lansing in the morning and I don’t like stopping on my way to East Lansing, so I wanted to fill up tonight. I knew there were a couple of Speedway’s along the way, so I talked myself into just getting some donuts for tonight and the morning. 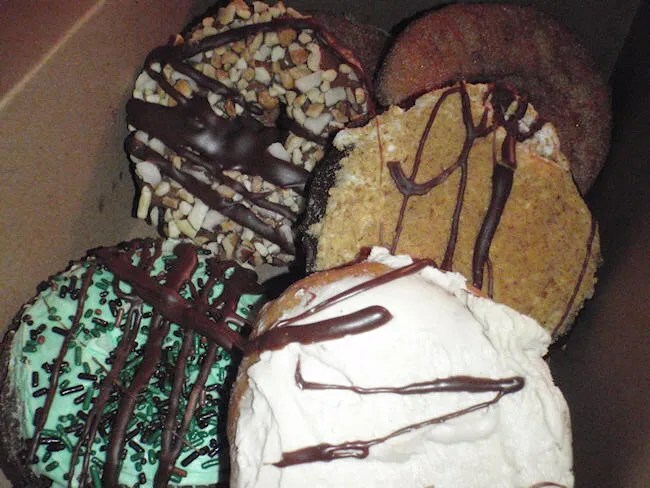 Sweetwater’s Donut Mill has three locations in Southwest Michigan. All of them are open 24/7. I went to the Kalamazoo Township location on Sprinkle Road just north of I-94. 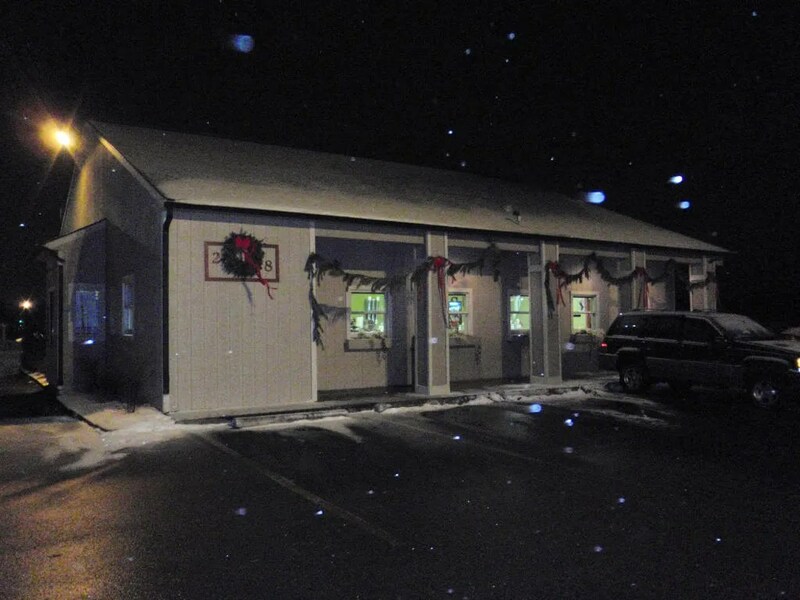 The building doesn’t really look like a donut shop from the outside. It’s a very discreet building with a few windows and a large red sign out front. Not many people had donuts on the brain at 7:30 at night other than me. The place was deserted except for the clerk who was putting boxes together for the morning rush. The inside of the store has a few booths and, of course, a breakfast counter. Great place to stop in, have a cup of coffee, and read the paper….oh, and eat a donut or two. Right inside the door is all the yummy pastries. I was completely overwhelmed when I first walked in. I usually just grab a dozen glazed donuts from a donut shop and I’m on my way, but Sweetwater’s has so many interesting creations I had to stop and soak it all in before I could actually put in my order. I only got a half-dozen. I started with two cinnamon sugar donuts then hit a wall. Where to go from there? The next one that jumped out at me was a Snicker’s donut. I then grabbed a couple I thought J would like. One is a S’more’s. The other is a Turtle. At this point, I’m up to five and I have one more. I almost picked a Buttermilk, but out of the corner of my eye I noticed the Peanut Butter Cup. Oh, how I love Peanut Butter Cup anything. 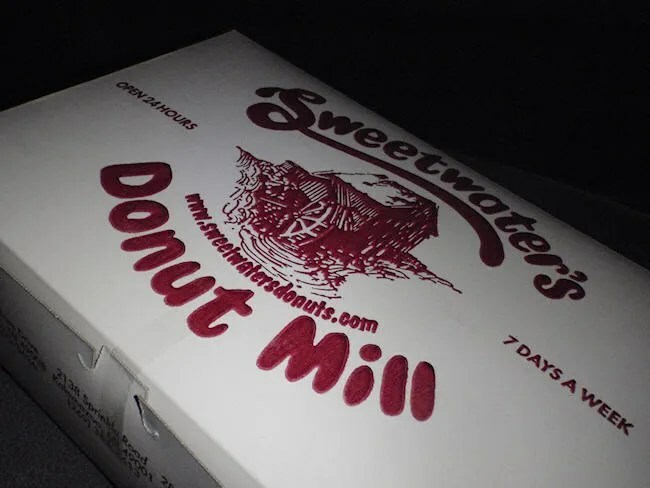 The six donuts cost me a little over four bucks which I paid for then headed back to my original destination of the gas station….where I found Sweetwater’s Donuts! Sure, I could have saved myself a trip and just went to the Speedway down the street, but I wanted the full selection. When I got home, J was already in bed, but I cut into a couple of the donuts right away. 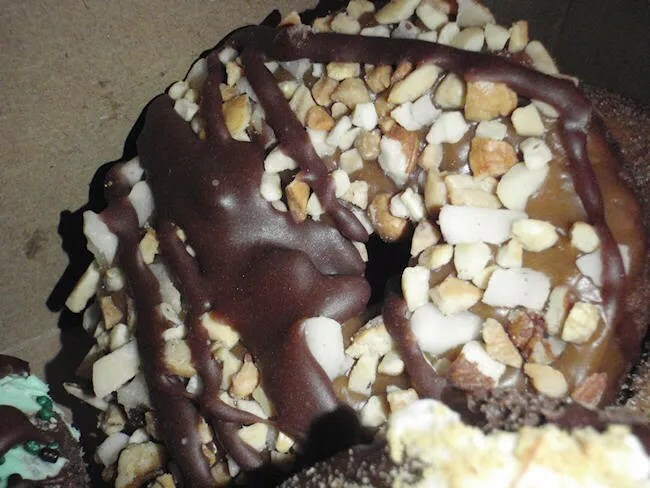 Of course, the first one I grabbed was the Peanut Butter Cup which is a yeast donut with a chocolate creme filling topped with a peanut butter creme and a chocolate drizzle. De-freakin-licious. I also cut off a hunk of the Snicker’s donut which is a chocolate cake donut with vanilla icing, toffee bits, and a chocolate drizzle. There are a lot of the toffee bits. It was so good, but it’s hard to call it a donut…at least what you traditionally think of as a donut. There was so much food on top of this donut that one of them is all you need for breakfast. Back in November, J and I were back in Chicago and I had a long conversation with one of her cousin’s boyfriends about sports and the University of Michigan football program. His family has been season ticket holders for decades and he said one of his favorite things about the drive from Chicago to Ann Arbor is stopping at a donut shop in Battle Creek. 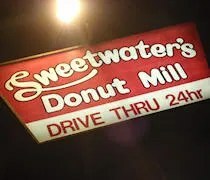 Of course, he was talking about Sweetwater’s and at that time, I couldn’t really imagine how a donut shop could be something you look forward to. I know now. Sweetwater’s is unlike any donut shop I’ve ever seen. Their creations are amazing and now that I know where it’s at, it’s going to be hard to keep me away from it.